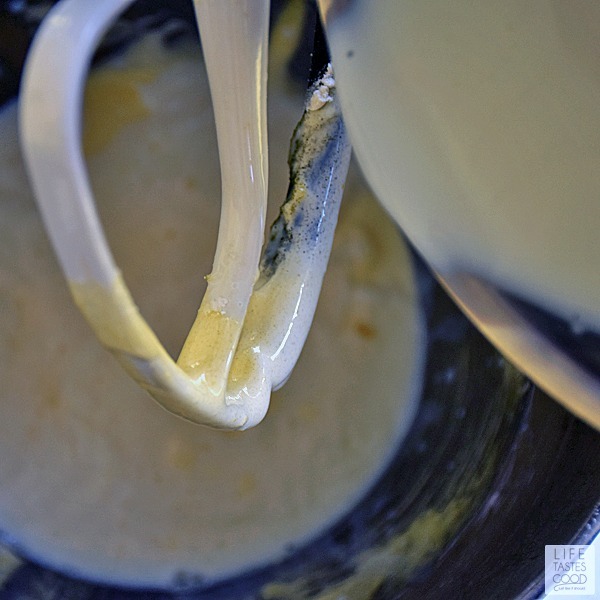 Pastry Cream is a silky, sweet French custard that is quite easy to make. Today I'll walk you through my tutorial on How To Make Pastry Cream that can be used in many different dessert recipes. Pastry Cream is a cooked mixture of milk, egg yolks, and sugar with vanilla or other flavoring, as well as a thickener to achieve the desired taste and texture. A little bit of butter mixed in at the end also adds richness. You have probably had pastry cream before. It is used as a filling in many different dessert recipes such as Chocolate Eclairs, Boston Cream Pie, Napoleons, Cream Puffs, Trifles, you name it. Pastry Cream is a very versatile cream, so let your imagination run wild and use it however you like. Something as simple as pastry cream topped with fresh berries makes an impressive dessert that is sure to get rave reviews! 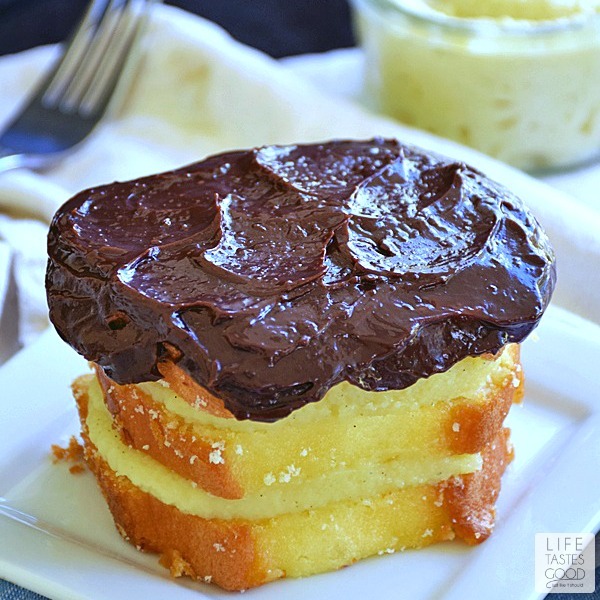 This easy, no-bake Boston Cream Pie is one of our favorite uses for pastry cream. The recipe is coming soon, so keep an eye out. You don't want to miss this one! Measure out the milk and separate the eggs, so we can get this Pastry Cream show on the road! I like to have my ingredients on hand as this goes sort of fast, and Pastry Cream waits for no one! 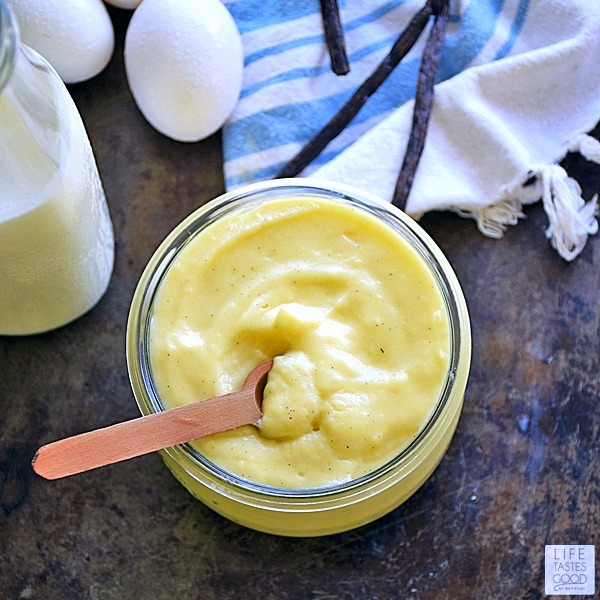 You'll need 1 1/2 cups whole milk, 5 egg yolks, 3/4 cup sugar, 3 tablespoons corn starch, a pinch of kosher salt, 1/2 tablespoon (or more to taste) vanilla bean paste or pure vanilla extract, and 1 tablespoon butter. Beat the sugar and yolks on mid-high speed for about 4-5 minutes until the eggs yolks become thick, pale, and ribbons form on the surface when you lift the beaters. The time it takes to reach this point will vary depending on the speed of your mixer. 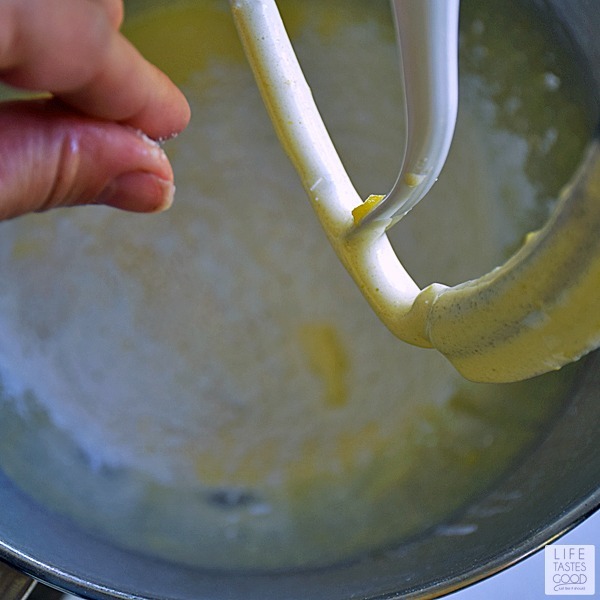 Once the egg mixture reaches the ribbon stage, reduce the mixer to low speed and add in 3 tablespoons corn starch and a pinch of salt. Mix until combined. Don't forget about your milk on the stove top! Check it periodically for the 'slivers of glass on the surface' look. When it reaches that point be sure to remove it from the heat. When the milk is ready, slowly pour half of the milk into the mixing bowl with the mixer on low speed. We want to heat the eggs slowly, so take your time when adding 1/2 the milk. and whisk constantly over medium heat until thickened. This will take about 5-10 minutes depending on the heat of your stove top. 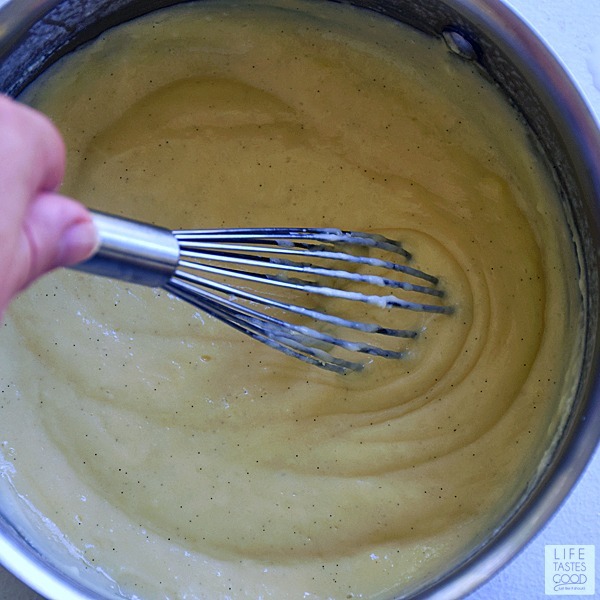 Whisking constantly during this time is key, so you can keep an eye on the mixture. 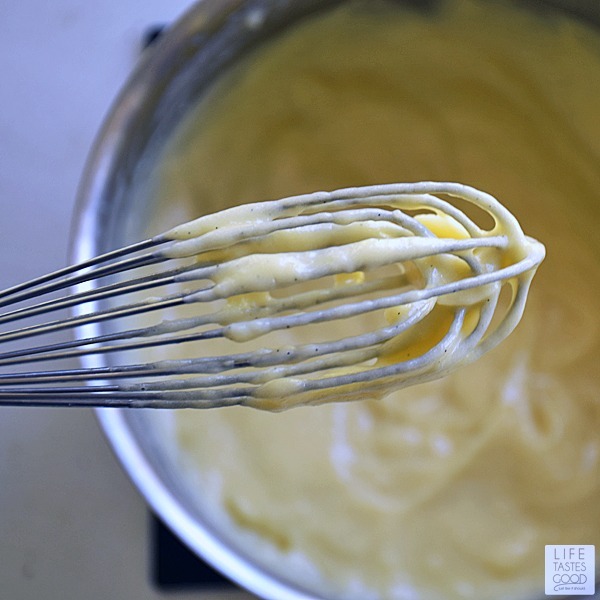 Once bubbles start to form on the surface, whisk for about 1 minute longer. During that time the mixture will really thicken and the color will deepen. 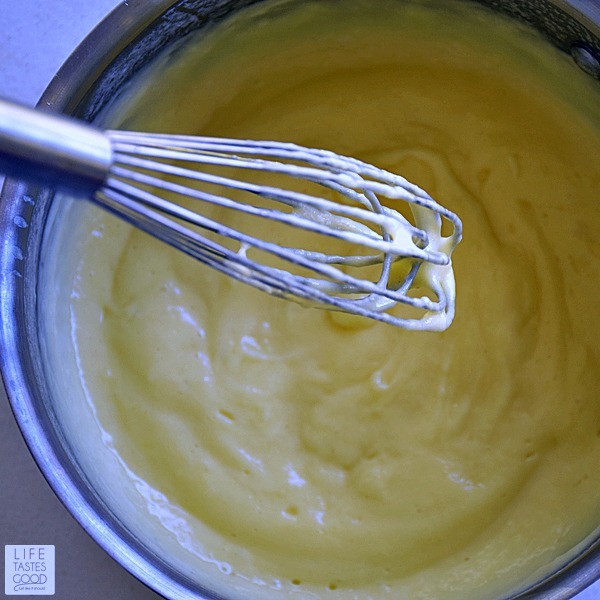 As soon as that color starts to deepen, remove it from the heat and continue to whisk until all one uniform color. Give it a taste and add more vanilla if you prefer a stronger flavor. Transfer to a heat proof container and cover with plastic wrap. Lay the plastic wrap right on the surface of the pastry cream to keep a skin from forming. Refrigerate until chilled. Because we heated the milk before mixing it with the egg mixture, there shouldn't be any lumps, but if you notice them I recommend pouring it through a fine mesh strainer. Nobody wants lumpy pastry cream! 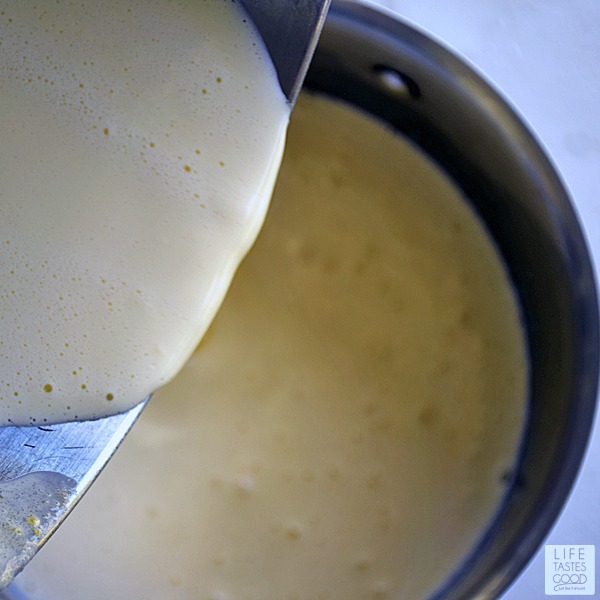 Start by heating 1 1/2 cups whole milk on the stove top over medium heat in a small saucepan. It will take about 5 minutes to heat it sufficiently. When it is close to being ready, you'll see a skin form on the surface of the milk, and you'll know it is ready when you see it shimmering. To me, the shimmering looks like slivers of glass on the surface of the milk. The time it takes to reach this point will vary depending on the heat setting. While the milk is heating, beat the eggs with the sugar. 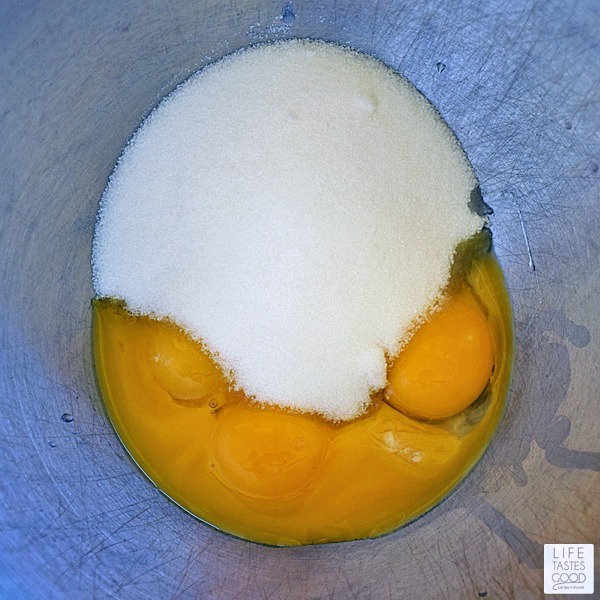 In a mixing bowl, combine 5 eggs yolks with 3/4 cup sugar and beat on mid-high speed for about 4-5 minutes until the egg yolks become thick, pale, and ribbons form on the surface when you lift the beaters. The time it takes to reach this point will vary depending on the speed of your mixer. 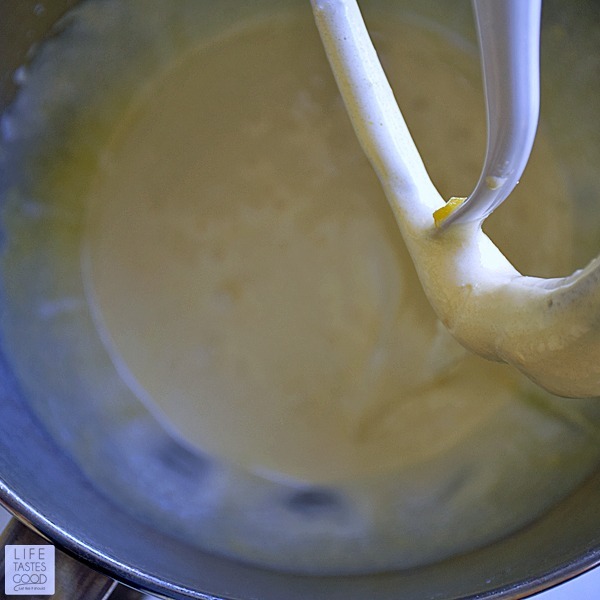 When combined, pour the mixture from the mixing bowl into the other 1/2 of the milk in the saucepan, and whisk constantly over medium heat until thickened. This will take about 5-10 minutes depending on the heat of your stove top. Whisking constantly during this time is key, so you can keep an eye on the mixture. Once bubbles start to form on the surface, whisk for about 1 minute longer. During that time the mixture will really thicken and the color will deepen. 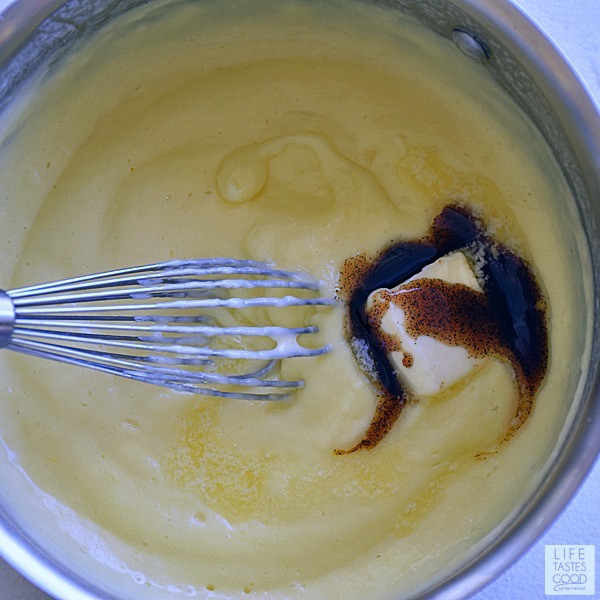 As soon as that color starts to deepen, remove it from the heat and continue to whisk until all one uniform color. 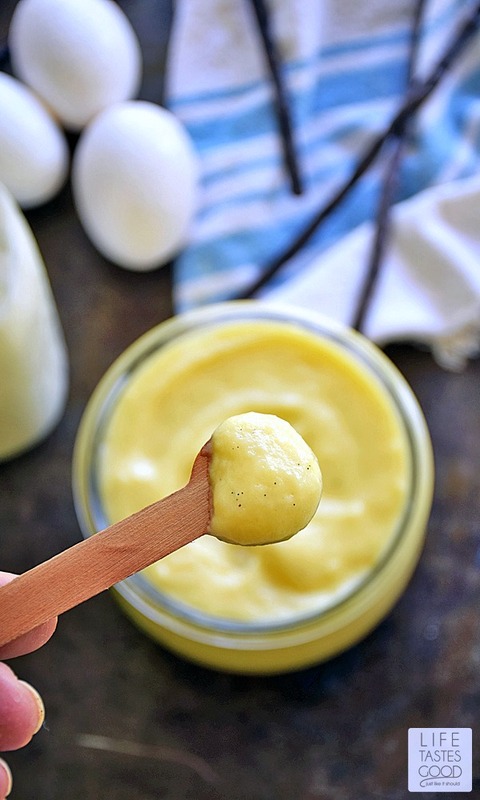 Add 1 tablespoon unsalted butter and a 1/2 tablespoon vanilla bean paste or pure vanilla extract and whisk to combine. Give it a taste and add more vanilla if you prefer a stronger flavor. Transfer to a heat proof container and cover with plastic wrap. Lay the plastic wrap right on the surface of the pastry cream to keep a skin from forming. Refrigerate until chilled. Because we heated the milk before mixing it with the egg mixture, there shouldn't be any lumps, but if you notice them I recommend pouring it through a fine mesh strainer. Nobody wants lumpy pastry. 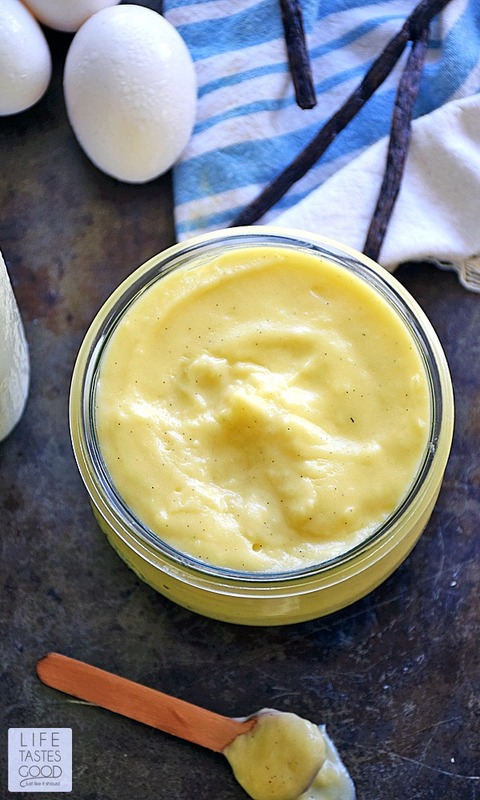 This is the most AMAZING and easy recipe for pastry cream ever! It turned out perfect. I made the chocolate cake on the back of the Hershey cocoa container, a two layer, then split the layers into four. Then this recipe for pastry cream in between each layer. DELICIOUS ! Thank you so much! Thank you so much for this recipe!! It looks pretty easy for a novice like me! I have all the ingredients ready and will try it out tomorrow. Thanks again for the step-by-step instructions and pictures, that really does help!! ~ Cecilia S.
That's great, Candela! I'm so glad the step-by-step pics help!! Enjoy! I found a wonderful recipe for a cookie tart filled with cream and drizzled with chocolate. Then read use boxed pudding. Thankfully I found your recipe and the little tarts were a huge success. Thank you! I'm glad you found this recipe too and it was a big hit!! Those cookie tarts sound amazing! You are most welcome! Enjoy!! Back here by husband's "demand". Although he has been loving the strawberry shortcake I had made for him, in Thursday, he requested the chocolate cake again, and of course, THIS pastry cream. After going thru my pins, I struggled to find it. Knew I would know it when I saw it (the look of glass when the milk was ready lol) and I found it. I tripled the recipe (thank goodness for the chickens here laying eggs for me, and the ducks too!) And, once again, NO LUMPS and an AMAZING flavor. So disappointed to see so many recipes for donuts and cakes and we spend time making them from scratch only to read "open a box of vanilla pudding". What a copout! Thanks again, and my husband thanks you too! Thanks for the reminder on the banana pastry cream, Karen. So good to hear from you! I will add that to my to-do list. I'm sorry I haven't gotten to that - it's been very busy. Our daughter moved out west and bought a home, so we've been traveling a lot lately to visit her and help out. We just got home a few weeks ago, and I've been trying to catch up on everything. I hope all has been well and you enjoyed a happy anniversary. Hi there. Making this again. So glad I found you again! It's now chilling in the fridge and I have a chocolate cake I made in the InstantPot pressure cooker. Needed to spruce it up with your beautiful pastry cream! Thanks again! This is great! Always thinking of what to do with the egg yolks after making macarons! btw- how long does it keep for? I will experiment with it to make a green tea matcha cream for a mille crepe. 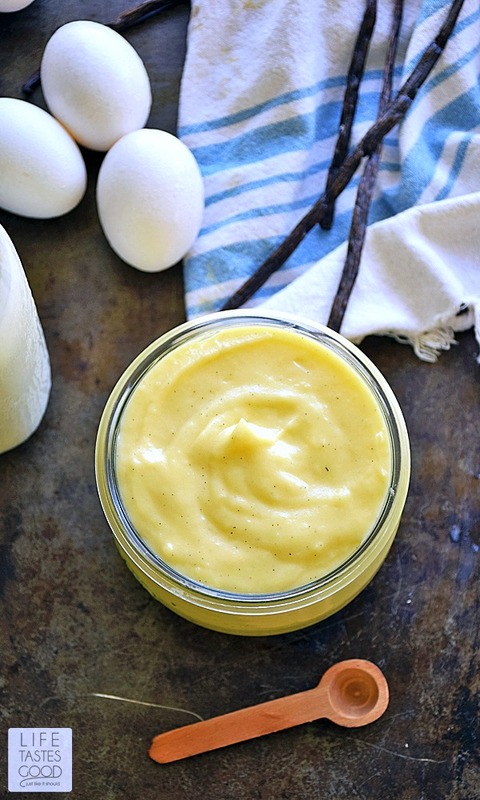 Did you ever create the banana infused pastry cream recipe? I'm back again. Haha. I think this is probably the 6th or 7th time. Have to fly to Seattle for a funeral of my brothers wife and need to make a treat for hubby to have while I'm gone. Last time I made a chocolate poke cake using your pastry cream as the poke filling. Wondering if I should not cool it first but just pour it over while the cake and/or pastry cream is still warm? Had to bang the sheet cake pretty hard to force the luscious cream down the holes last time. Lol. But it was chilled too. Again, your recipes are amazing and never a disappointment. Hope you're having a great week! Hi Karen! I have not had a chance to make it yet, sadly. My husband keeps asking me the same thing haha. I'm so glad you like this recipe, and so sorry to hear about your loss :(. I hope you had safe travels on your trip. Pouring it over while still warm would be a lot easier to get it down into those holes. I love your idea for using this for a poke cake. I will have to try that. Thanks for the suggestion and your kind words. It is always a pleasure to hear form you :) Have a super week!! 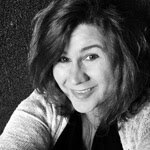 Hi Karen, you always make my day! Thanks for your sweet words. I sure hope that heat wave breaks for you soon so you can get back to your beautiful weather. My daughter lives in the San Fran area and says it's been very hot too. We are going for a visit in a few weeks so I told her that needs to change. We want to escape the heat and humidity of FL and enjoy some beautiful west coast weather 😊😊😊 stay cool!